91% of people in Fuller Democracy 2017 rated resolving the housing crisis as the top priority for Fingal. The keystone of my housing policy is the introduction of rent caps that will limit the rate at which rent can be increased. 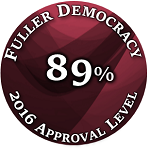 In Fuller Democracy 2016, 89% of people who took part voted in favour of introducing rent caps that are pegged to inflation. Rent caps will stabilize housing prices in both the rental and home ownership markets, with no negative repercussions for home owners. These rent caps would apply to the property rather than the tenancy, meaning that a landlord could not get around them by evicting their tenants and hiking the rent dramatically for the next occupants. By providing rent caps we will reduce the number of people who need to avail of social housing and housing assistance payment. As of 2013, 15% of people on the social housing list were in some form of employment, a number that had increased to 20% by 2016 (not including those on FAS/back-to-work schemes). That is a significant number (Source). While there will always be a need for social housing, there should not be a need for it among people who are employed, as is the case today. Indeed, it is an insult to working people not to be able to afford the roof over their own heads. At the moment, there is not even an appreciable gap between earning enough to pay the higher income tax rate of 40% and little enough to qualify for social housing in Fingal. In a well-run country with joined-up thinking, there should be quite a wide margin between the point where a person needs assistance for something as basic as shelter and the point where they are paying the top tax rate. If that is not the case, there is only one reason for it: housing prices are too high compared to wages and people are making more from ‘rent-seeking’ activities (…like charging rent) than from productive income. Rent caps allow housing prices to stabilize while wages gradually creep up without creating a shock to the housing market. In the long run, fewer people will need to avail of social housing and that means we will be in a better position to meet demand for it. The real beneficiaries of providing social housing (and housing assistance) to people in employment are the companies employing those people (because they are enabled to pay their employees less than the basic costs of living demand) and private landlords (who are overcharging rent to people on housing assistance, because they know they will get the money from the government). 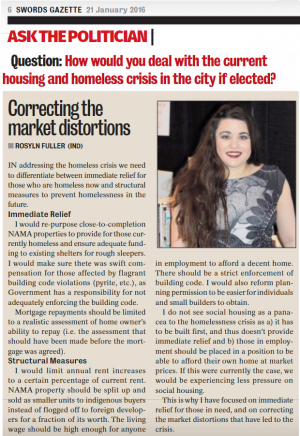 While I think that in a well-regulated housing market, people who are in employment should be enabled to rent or buy at market prices, there will always be a need for some social housing (although reduced to approximately 85% of the current demand). In the long run, social housing for people in mid-to-long-term need of accommodation is a more efficient, stable alternative than rent supplement provided that social housing units are under the ownership of the local authority. Thus, we should be aiming to increase our supply of social housing to a level where only short-term accommodation is dealt with through rent supplement. I wrote about this in the Swords Gazette (now Fingal Gazette) in the run-up to the last election. Click on the image to read the full edition (interview is on page 6). Even if most people continue to (barely) be able to afford their accommodation, the exorbitant housing prices are having a detrimental effect on their lives (no disposable income = lots of worries, no fun and little ability to invest in yourself). Rather than going to local businesses to pay for needed goods, a fair portion of the money being paid on high rents is being sucked right out of the Irish economy by the foreign vulture funds that have taken over much of our housing stock (Ian Kehoe’s documentary ‘The Great Irish Sell-Off’ is well worth watching here). Whichever way you slice it, rent caps make sense and are the least disruptive and most effective way of regulating housing and bringing costs down to a reasonable level. The current government policy of giving money to people who are buying a new-build home is diametrically opposed to policies like introducing rent caps. It achieves nothing beyond subsidizing the large developers selling those new homes while simultaneously inflating housing prices. Thus, I oppose this measure and would reverse it. Bringing interest rates down on mortgages is also a key point of my policy. Irish mortgage holders pay a higher rate of interest than mortgage holders in other European countries. This means that we can end up paying tens of thousands of Euros more for a mortgage on an equivalent value house. Again, this is money that is essentially being sucked straight out of the economy. Your house isn’t worth more just because you paid more for it in terms of interest. Putting this money back into people’s pockets in terms of disposable income would help them and have a positive effect on the economy. It goes without saying that the banks involved in the tracker mortgage scandal should be fined (heavily) for their actions and the victims compensated. (See here, here and here for more information on this point). Of course, since we have already gotten to the stage where some of the banks involved are partially publicly-owned, we aren’t necessarily in a position to punish banks without hurting ourselves a little in the process. Thus, I also propose for this matter to be investigated and for those found responsible for wrongdoing to be prosecuted in court. Overcharging 30,000 people across at least four different institutions on their mortgages didn’t ‘just happen’. There were surely individuals who either caused it to happen or who let it happen. In Fuller Democracy 2017, 88% of people said that the European Union should take a stronger role in regulating finance and insurance. It has been demonstrated time and again that individual nations, including our own, are having a very difficult time enforcing proper bank and insurance regulation. Thus, this is an area where we should be pushing for closer integration, harsher rules and ruthlessly efficient oversight at a European level. The social housing list needs to be more accountable and transparent. At the moment, people who are on the social housing list can wait years for a home, without any idea of when one will materialize. This uncertainty is both cruel and destabilizing, and it can allow for corruption (or the appearance of corruption) in determining who gets a house first. 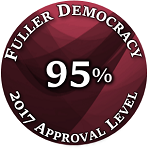 95% of people who participated in Fuller Democracy 2017 supported making the social housing list more transparent. I propose to do this in a manner that preserves privacy by using a system that is similar to that used in universities to communicate exam marks to students. In this system, each household on the social housing list would receive a number unique to them. The County Council would be obliged to publish a list online ranking each person/family and giving a rough approximation of when they are likely to receive accommodation. This list may be subdivided according to different needs: e.g. 2-bed, 3-bed, etc. The criteria that the Council uses to determine priority must also be clear and public. Changes to the list should be justified in general terms that do not infringe on the privacy of those concerned. The Council should also have to mark each entry as it is fulfilled for a minimum of three months (rather than just immediately removing it from the list). This would not be perfect (mainly because of the need to preserve privacy), but it would at least give us a start on accountability in the provision of social housing, and provide those waiting for social housing with a broad time frame to work with in planning their future.